Enlighten minds beyond physical reach. Unlimited storage. Untarnished scalability. An e-learning solution with an assorted range of broadcasting capabilities. Reach the learning masses through streaming choice of convenience. Vplayed creates platforms where you can stream live, on-demand or both combined on the same site. Deliver impactful learning through options for scheduling lectures beforehand and send alerts with the help of push notifications. 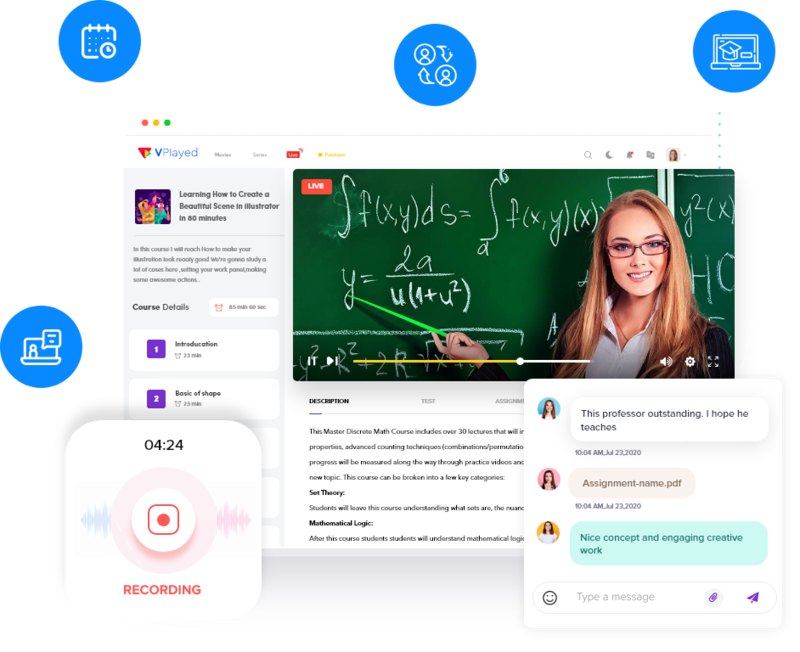 Engage in interactive knowledge sharing via streaming that allows quizzing, commenting and communicating through videos. Build an e-learning platform like no other with customisation on all fronts and make the most of design and distribution. Stream videos in high definition and low latency with the help of HLS video player or any other player of your choice. Make it big on digital platforms with social outreach, content/target marketing, and suggest algorithms. Vplayed’s streaming solutions are built to be compatible for streaming on for any device. Let your students access through their choice of screen/device. Present your student base with caption settings for multiple languages, sizes and colours. Make your content available and connected across all major social media platforms in order to attain maximum reach among students. User behaviour analysis, & report summaries allows online tutoring to yield the best constructed programs for students. Vplayed’s streaming solutions are search engine compatible and fashions your platform to be easily reachable for your targeted audience. Built with the latest technical stack, Vplayed built platforms are equipped with custom HLS player that enables flexible and highly scalable streaming. Retain scholars by suggesting relevant courses with a brief summary of the syllabus covered in corresponding courses. Vplayed provides a tweaked model of transactional VOD for education in which, the streaming solutions can sell offline videos of entire courses or individual videos.